wooden board approx. 5 in. square. wooden board approx. 15 cm. square. 4.5 to 5 cm. dia. cardboard tubing. Lessons In Electric Circuits, Volume 2, chapter 13: "AC motors", "Single Phase induction motors","Permanent split-capacitor motor". To build an AC permanent split-capacitor induction motor. To illustrate the simplicity of the AC induction motor. There are two parts lists to choose from depending upon the availability of 120VAC or 220VAC. Choose the one for your location. This set of instructions is for the 120VAC version. This is a simplified version of a "permanent capacitor split-phase induction motor". By simplified, we mean the coils only requires a few hundred turns of wire instead of a few thousand. This is easier to wind. Though, the larger few thousand turns model is impressive. There are two stator coils as shown in the illustration above. Approximately 440 turns of #32 AWG (American wire gauge) enameled magnet wire are wound over a one inch length of a slightly longer section of 1.75 inch diameter toilet paper tube. To avoid counting the turns, close-wind four layers of magnet wire over a one inch width of the tube. See (b) above. Leave a few inches of magnet wire for the leads. Tape the beginning lead near the end of the tube so that the windings will cover and anchor the tape. Do not cut the final width of the cardboard tube until the winding is finished. Close wind a single layer. Tape or cement the first layer to prevent unwinding before proceeding to the second layer. Though it is possible to wind additional layers directly over existing layers, consider applying tape or paper between the layers as shown in schematic (b). After four layers are wound, glue the windings in place. If close winding four layers of magnet wire it too difficult, scramble wind 440 turns of the magnet wire over the end of the cardboard tube. However, the close-wound style coil mounts more easily to the baseboard. Keep the windings within a one inch length. Cut the finished winding from the end of the cardboard tube with a razor knife allowing the form to extend a little beyond the winding. Strip the enamel from an inch off the ends of the pair of lead wires with sandpaper. Splice the bare ends to heavier gauge insulated hook-up wire. Solder the splice. Insulate with tape or heat-shrink tubing. Secure the splice to the coil body. Then proceed with a second identical coil. Refer to both the schematic diagram and the illustration for assembly. Note that the coils are mounted at right angles. They may be cemented to an insulating baseboard like wood. The 25 watt lamp is wired in series with one coil. This limits the current flowing through the coil. 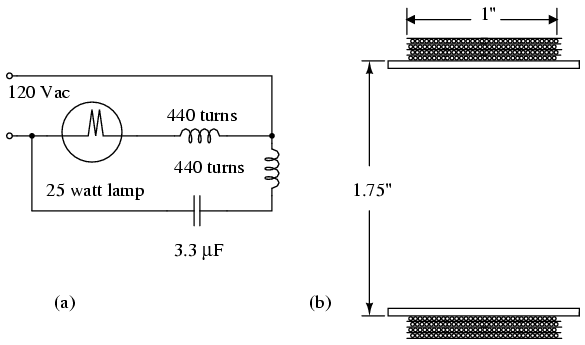 The lamp is a substitute for an 820 Ω power resistor. The capacitor is wired in series with the other coil. It also limits the current through the coil. In addition, it provides a leading phase shift of the current with respect to voltage. The schematic and illustration show no power switch or fuse. Add these if desired. The rotor must be made of a ferromagnetic material like a steel can lid or bottle cap. The illustration below shows how to make the rotor. Select a circular rotor either smaller than the coil forms or a little larger. Use geometry to locate and mark the center. The center needs to be dimpled. Select an eighth inch diameter (a few mm) nail (a) and file or grind the point round as shown at (b). Place the rotor atop a piece of soft wood (c) and hammer the rounded point into the center (d). Practice on a piece of similar scrap metal. Take care not to pierce the rotor. A dished rotor (f) or a lid (g) balance better than the flat rotor (e). The pivot point (e) may be a straight pin driven through a movable wooden pedestal, or through the main board. The tip of a ball-point pen also works. If the rotor does not balance atop the pivot, remove metal from the heavy side. Double check the wiring. Check that any bare wire has been insulated. The circuit may be powered-up without the rotor. The lamp should light. Both coils will warm within a few minutes. Excessive heating means that a lower wattage (higher resistance) lamp and a lower value capacitor should be substituted in series with the respective coils. Place the rotor atop the pivot and move it between both coils. It should spin. The closer it is, the faster it should spin. Both coils should be warm, indicating power. Try different size and style rotors. Try a small rotor on the opposite side of the coils compared to the illustration. For lack of #32 AWG magnet wire try 440 turns of slightly a larger diameter (lesser AWG number) wire. This will require more than 4 layers for the required turns. A night-light fixture might be less expensive than the full-size lamp socket illustrated. Though night-light bulbs are too low a wattage at 3 or 7 watts, 15 watt bulbs fit the socket.